Intended to cut through chicken and other light meats, these firm grip poultry shears make it easy to slice up ingredients for popular dishes. 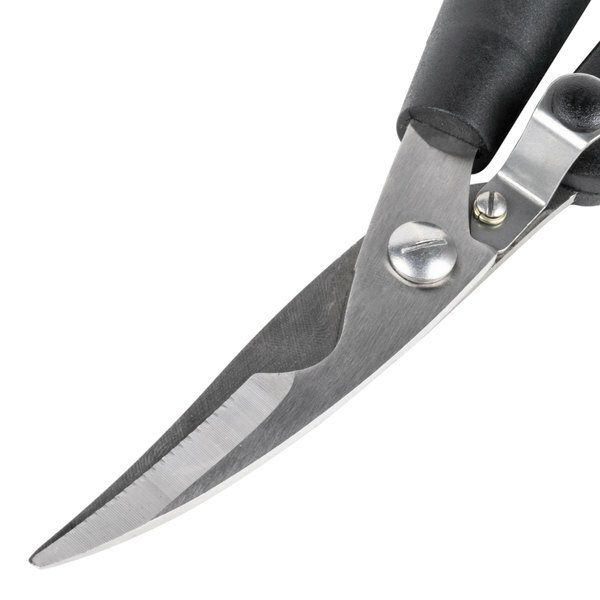 These shears have tapered stainless steel blades for superior performance, and their firm grip handles prevent slipping during use. For the best in safety, these shears also come with a locking mechanism to keep the blades shut during cleaning and storage. Easily cut up chicken and other poultry with these firm grip poultry shears! These strong kitchen shears are the perfect choice for cutting through light meats for your most popular dishes. To find out more, watch this short video. 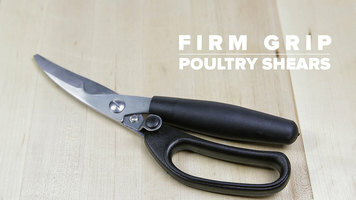 Use these firm grip poultry shears to easily cut down your poultry into the segments that you desire! Offering an excellent performance, the long and curved blade creates a proper angle for easier cutting. Additionally, the tapered stainless steel blade is durable for use and easy to maintain. On top of making it a breeze to cut poultry, these shears have a soft grip that offers optimal comfort when the user is applying force. A small locking mechanism ensures the blade stays shut when it's not in use so you can also rest assured that it's a safe tool to keep on hand in your establishment. These shears are excellent, I was using an old pair before that hurt my hands but these are so much better. I shouldn't have waited so long before getting a new set of shears. Highly recommend. These are good. My clippy that holds the handle together broke quickly though. Much cheaper than at my local supply stores. Just as I expected, clean neat good product, and what I was looking for. I wish I had these to take the back bone out of my turkey on thanksgiving. These can cut right through bone and work well for trimming ribs. These poultry shears work well and will cut through small bones. They are easy to grip and use. The price is what I like best about them. I love these shears! Not only are they economical but they are very comfortable to use. I have weak wrists and I can use these without problems. I like the design and it makes them easy to grip. You will be glad that you got these. The Firm Grip Poultry Shears are something we use on a regular basis. Theyre absolutely wonderful. We typically serve rosted whole chicken at events, and we use these shears to cut through the parts that are a little harder to get through! A better pair of shears than my old ones, it has a comfortable handle and cuts through chicken bones with ease. Will be trying turkey next! These are a great addition to my kitchen and catering company! Especially when I make Chicken stock and have to break doen whole chickens. I love the bouncy spring. It really helps with hand fatigue. Have to run them Cross the knife steel pretty often. They're good for the price and work well for butterflying a whole chicken. They are not sharp enough to cut the chicken skin, however. And yes, I would buy them again..
Low price for these heavy duty shears! They are durable, have very sharp blades, and a very strong hinge/connection. The stainless steel is tough and these are probably the best quality shears I've ever owned. These tough shears worked great when we used them to take the back bone out of our turkeys this year so we could flatten them on the grill. Cut through the bones like butter! I love it. Awesome, don't know why I didn't order these long time ago i uses around the kitchen, besides cutting chicken. i Used many times to cut other polarity. Love these shears! The bit of spring they have to them gives great leverage when cutting the thigh joints or back bones out of poultry. The locking mechanism makes it easy to store. Tough on bone, easy on hands! I have been using this of all sort of meat and bone, and it works like a charm. It has a sturdy and comfortable feel in the hands. I like these poultry shears, I was able to spatchcock a chicken for the first time pretty easily. I can't speak to their durability, but they seem sturdy and of good quality. These work really well and the safety lock is nice as well. These work best when cutting with the tip half of the blade, so it feels strange at first, but ultimately does a better job than our previous shears. Great in a commercial setting - takes a lot of power and strong hands to use and they are heavy, but that's what you need to get the job done. These lasted for about 5 minutes in my BBQ restaurant. Within no time at all they were inoperable and have become a unique paperweight on my desk. Save your money. They're garbage. We appreciate your review, Jim! We are sorry you were not happy with your poultry shears, please contact our Customer Solutions team if you would like a recommendation for a different product. These shears are used in our restaurant to cut our chickens. They work well for a while, but tend to get dull after a few months. Shears did a fine job for what they are intended, I bought these for people that was helping me off and on. They suited the purpose designed. Just your normal kitchen shears. They do cach where the blades first meet. But nothing my bench grinder can't fix. If your looking for a good quality cheap pair of scissors then this is a good buy. These are great scissors. They are very strong and cut through chicken just fine. I have smallish hands and they were very comfortable. Good Buy. 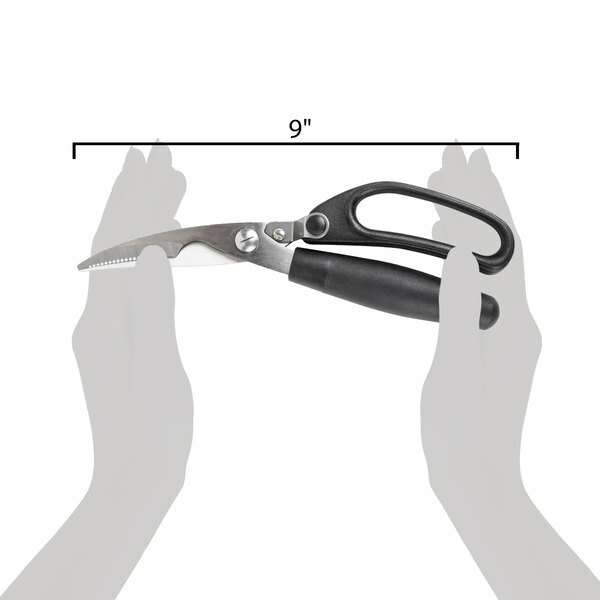 These firm grip poultry shears give just that: a firm grip! They are reliable and sturdy. You can cut through thick chunks of meat and they wont' break. Great buy! I've never owned poultry shears before. These work well for breaking down whole chickens and separating wings and legs. The only downside is that sometimes the locking mechanism will swing back in place while in use and you have to keep unlocking it. But that may be user error. These shears worked great until the third time I used them while butchering chickens. The handle broke right off while cutting a leg bone. Very disappointing. I guess you get what you pay for. Thanks for the review, Marie! We are sorry these shears did not hold up to the task you were performing. 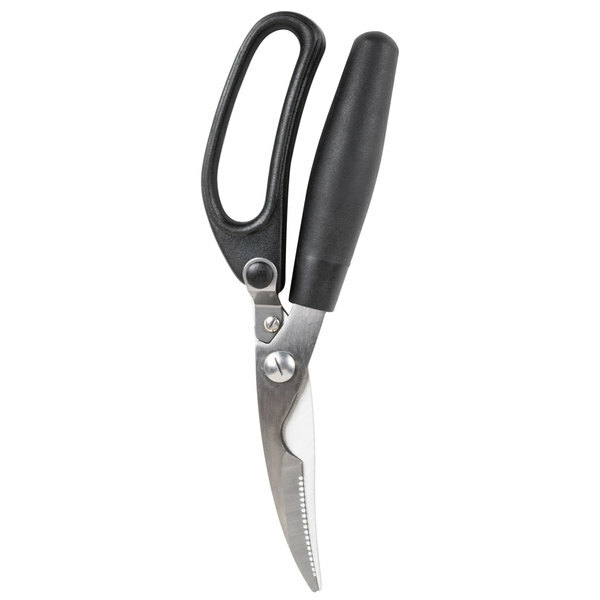 Try these Victorinox 45903 10" Heavy Duty Stainless Steel Poultry Shears instead for a heavier duty alternative. These feel ok in my hands. Don't know if they will hold up too long but it fits pretty well and I'm left handed with is usually tough. Thank you for your review! We are sorry the poultry shears did not hold up through the heavy duty butchering you were doing. For shears more suited for large quantities of chicken, try these Victorinox 45903 10" Heavy Duty Stainless Steel Poultry Shears. Great tool for the home and pro cook. Easily process birds without having to dig around for tendons. Just snip right through bone to prep perfect pieces. The best poultry shears that I`ve ever bought. The grip handles is really firm and non-slip. This shears cut on fresh or cooked poultry, with bones or without, as butter, It also have a security small mechanism which allow them to be close or open perfect for carring on your knife case. This is a fantastic pair of scissors for cutting up fish bones to make a nice stock with! It works quickly for cutting chicken and other birds effortlessly!! I just bought in a case of whole chickens to cut up for a party and I never touched a knife. This thing goes through bones like butter. Backbone, breastbone... nothing is too tough for this shears. These firm grip shears really do have just that, a firm grip. They let you apply a good amount of power to what you're cutting without straining. I really like these shears. These are pretty essential for both the professional restaurant chef and the home cook. very easily cut through chicken and all sorts of products. great for snipping through fish bones too.